Judging by a number of testimonies, the site has proved valuable to many women benefiting from advice and the sharing of information; for a couple of examples see the postings by Sally, Nourshehane, Jeweler46, and Cindy (starting here, continuing here, and ending here). Others have found solace in kindred spirits (see the posting of Becs). Still others have drawn conclusions from their own experience and offered these for general use (see the posting of Standfree). After a slow start, the discussion took off and now has 17,000 comments, or about four a day. I believe this to be a premier website for this topic. From the perspective of www.DanielPipes.org, about one in eighteen comments on the website are on this page. It is remarkable for its undiplomatic and anecdotal tone, so distant from the department's standard bureaucratic style. For prospective spouses, "Marriage to Saudis" constituted an official tutorial in Saudi culture; for others, it served as a fascinating example of practical anthropology, school of hard knocks. American citizen wives swear that the transformation in their Saudi husbands occurs during the transatlantic flight to the Kingdom. There is the universal recollection of approaching Riyadh and witnessing the donning of the black abayas and face veils by the fashionably dressed Saudi women. For many women, the Saudi airport is the first time they see their husband in Arab dress (i.e., the thobe and ghutra). 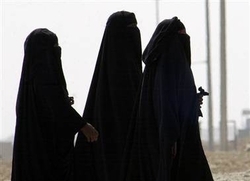 For those American women reluctant to wear an abaya (the all-encompassing black cloak) and for those Saudi husbands who did not make an issue of the abaya prior to arriving, the intense public scrutiny that starts at the airport—given to a western woman who is accompanying a Saudi male—is usually the catalyst for the eventual covering up. Since the overwhelming majority of American citizen wives never travel to the Kingdom prior to their marriage, they are abruptly catapulted into Saudi society. When, for example, a Catholic woman and a Muslim wish to marry, ... bitter experience teaches us that a particularly careful and in-depth preparation is called for. During it the two fiancés will be helped to know and consciously "assume" the profound cultural and religious differences they will have to face, both between themselves and in relation to their respective families and the Muslim's original environment, to which they may possibly return after a period spent abroad. In any case, the marriage between a Catholic and a Muslim, if celebrated in spite of all this, requires not only canonical dispensation but also the support of the Catholic community both before and after the marriage. One of the most important tasks of Catholic associations, volunteer workers and counselling services will be to help these families educate their children and, if need be, to support the least protected member of the Muslim family, that is the woman, to know and insist on her rights. Dec. 1, 2005 update: Cardinal Camillo Ruini, president of the Italian Bishops Conference and a right-hand man to Pope Benedict XVI, issued a statement yesterday on behalf of the conference, warning against Catholics marrying Muslims. "In addition to the problems that any couple encounters when forming a family, Catholics and Muslims have to reckon with the difficulties that inevitably arise from deep cultural differences." He also noted that it is usually a Catholic woman who marries a Muslim men, that usually she converts, not he, and their children tend to be brought up as Muslims. Further, if an Italian woman marries a Muslim immigrant and they move to his country of origin, her rights are "not guaranteed in the way they are in Italy or in other Western nations." Such marriages, the statement concluded, should therefore be discouraged. Dec. 26, 2005 update: Stephen Fumio Hamao, a Japanese Catholic cardinal, wrote in 2004 about the "bitter experiences" of European women who marry Muslims. Because our country receives people of all nationalities, cultures and religions, you may meet and develop a relationship with a Muslim man. He may be especially attractive because of his dark good looks, education, financial means and the interest he shows in you. You may be excited that you have found the 'tall, dark and handsome man' you have been looking for. His sweet words and attention may blind you regarding the influence of his Muslim religion and culture. Because we have freedom of religion, he may agree that you can keep your religion and you may think there will be no problem with such a marriage. Do not be deceived and become a victim of his religion which has very oppressive rules regarding women's status and rights. Such a marriage will cause you great heartache. If you are married to a Muslim, never even consider giving up your Lord and Savior Jesus Christ under any situations. June 25, 2008 update: But not all the advice against intermarriage is directed to non-Muslim women. AKI reports today that, in response to the growing number of Moroccan women who are marrying European men, Sheikh Mohammed al-Tawil of Fez, Morocco insisted in an interview with Al-Arabiya television that marriage between Moroccan women and non-Muslim European men is unacceptable. "This kind of marriage, between Moroccan women and European men, is forbidden by the Koran and the Sunna. A Muslim woman may not marry an unbeliever while a Muslim man may marry Christian and Jewish women." If the European men convert to Islam, that changes everything, he went on; then, Moroccan women may marry them. "Islam only requires two witnesses for someone to be able to convert and [then] such a marriage is valid." But this is not to be undertaken lightly: "If a European then decides to abandon Islam, Muhammad's words apply to him: those who renounce their own religion must be killed, as they are apostates." Tawil's position represents classic Shari'a but it contravenes the 2005 reforms of the Mudawana, Morocco's family law, which eased the way for foreigners to marry Moroccan women. Indeed, almost 6,000 such marriages were registered in Morocco in 2007 – about six times as many as a decade earlier and more than the number of Moroccan men who married foreign women that year (which was just over 4,300). are not encouraging, because with the passage of time there is often a return to [the spouses'] cultural, social, religious, and legal origins, with sometimes dramatic consequences, which the children pay for. Jose Policarpo, head of the Catholic church in Portugal. 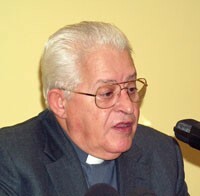 Jan. 14, 2009 update: Another cardinal weighs in, this time the head of the Catholic Church in Portugal, Jose Policarpo. He advised Christians to respect Muslims and to learn more about Islam. But he said warned Portuguese women from marrying Muslim men: "Think twice before marrying a Muslim, think very carefully. You can get into a whole lot of trouble, and not even Allah knows where it might end." The organization decided to do something after receiving complaints from many women who claimed to be harassed by non-Jewish men on the beach. "Last year we discovered that there are many gentiles arriving at the beaches, but not in search of the sun or water," said Benzi Gopstein, one of Lehava's leaders. "The volunteers handing out the leaflets are all seculars, as the religious public only visits segregated beaches, which don't have the Arab problem. We've also started distributing a clip on Facebook and YouTube and we hope the girls will open their eyes. ... We turn to the girls with a plea: 'There are enough good Jewish men you can go out with'." I would strongly advise to any non-Muslim woman NOT to get involved with a Muslim man. They will NEVER change, no matter how Americanized they seem. Their culture is too ingrained in them. They might want to be Western and they might live a Western lifestyle with their wife but once you have kids EVERYTHING will change. Nov. 22, 2014 update: For a verse version of the same conclusion, read "Those Egyptian Men" by a woman who lives in Canada. June 28, 2015 update: Four years later, more news about Lehava (see above, July 17, 2011): It now haunts nightlife venues and hands out to women up to 5,000 sweets a night accompanied by a postcard that says: "My sister, I am thinking about you, I feel you. You have a pure Jewish soul! Don't get lost, don't go with Mahmoud. He'll start by being sweet and then he'll start to beat ... reaching out to help you, Lehava." Jewish Home 2018 election campaign poster in Ramle. 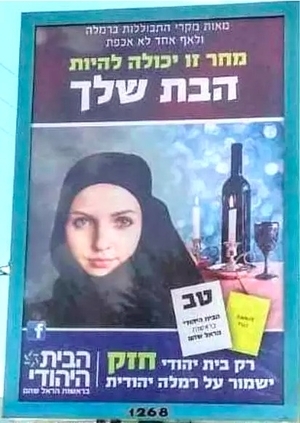 Oct. 16, 2018 update: The Israeli political party Jewish Home (Bayit Yehudi) posted campaign ads in the town of Ramle showing a young woman in a black hijab (a Muslim head-covering) against a backdrop of two white candles, wine, and a wine cup (items used at the start of the Jewish Sabbath); the implication is that the woman converted from Judaism to Islam. The text on the poster then calls for votes to prevent this from happening: "Hundreds of incidents of assimilation in Ramle, and nobody cares. Tomorrow it could be your daughter. Only a strong Jewish Home will keep Ramle Jewish."